France-based SECRET SEASON just released their fourth album, entitled “love is the only game in town”. The duo consists of Mark Moogalian on vocals, guitars, keyboards, drums, trumpet, musical saw and Isabelle Risacher on vocals, keyboards and flutes. Mark Moogalian: author, songwriter and performer, originally from Richmond, Virginia, he started playing guitar at the age of sixteen and while in his early twenties formed Look Like Bamboo and Javaman. He came to Europe in the nineties to get inspiration from the culture (France especially) and followed his passion with original acoustic creations and played solo. In 2002, he met Isabelle Risacher, author of poems and songs, musician amateur and singer in a Gospel group. She also spent 10 years in New England, Maryland and in San Francisco. They are both largely bicultural, bringing the best of both worlds. 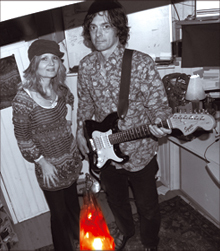 Mark and Isabelle have been making music together since 2005. Laureates of the « Rock en Strophe »competition in 2006 under the name of Rhythm Ducks, they changed their name to SECRET SEASON in 2009. They released “On Our Own”, their first album, in the spring of 2011. Then “Paris Rain Dances” in the summer of 2012. Followed by “The Answer” in the spring of 2014.